Greg Gutierrez was nearly 5 pounds out of the lead after day 1 of the Lake Shasta FLW Western Costa Series, but ended up winning by almost that same margin. 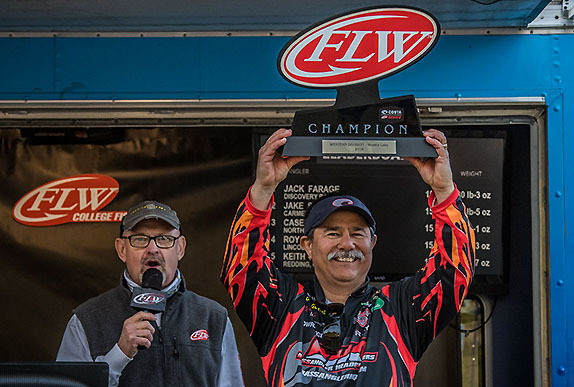 Conditions set up just right for Greg Gutierrez at last week's Lake Shasta FLW Western Costa Series, and the retired firefighter and former Bassmaster Elite Series pro won the event on his home lake throwing a shaky-head that he created. Gutierrez found a lot of big fish hanging in the 30-foot depth range during practice, and the nasty weather that plagued the event � which followed an extended period of spring-like conditions � ensured that they stayed there. He did most of his work with a finesse worm attached to a 1/4-ounce Frenzy Nail stand-up jighead that took 3 years of testing and refining before it was ready to bring to market. The Red Bluff, Calif. resident was nearly 5 pounds behind leader Richard Dobyns after day 1, but was dominant the rest of the way to leave the remainder of the field nearly 5 pounds in his wake at the end. His 13 1/2-pound-per-day average wasn't eye-popping by high-level tournament standards, but it was stout on a lake that's primarily a spotted bass fishery and in weather that was a lot more suited for duck hunting than fishing. 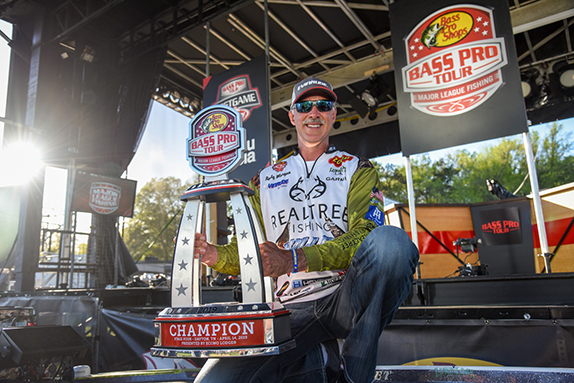 The win was the two-time Classic qualifier's most significant victory since a Bassmaster Open triumph at the same venue in 2004. Following are some of the details of how he achieved it. 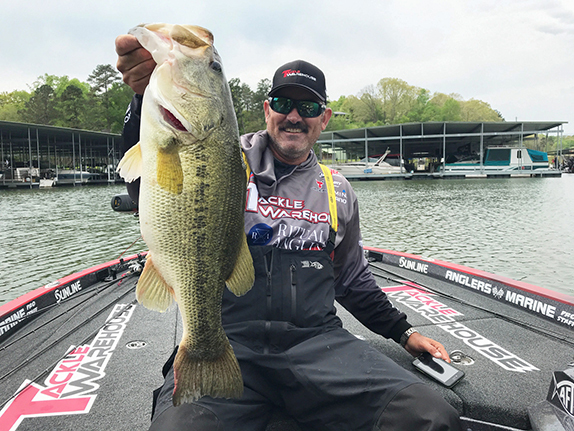 Gutierrez spent the initial part of this practice period fishing with Gary Haraguchi, a Shasta ace who lives in nearby Redding, Calif. and competes on the FLW Tour as a co-angler. 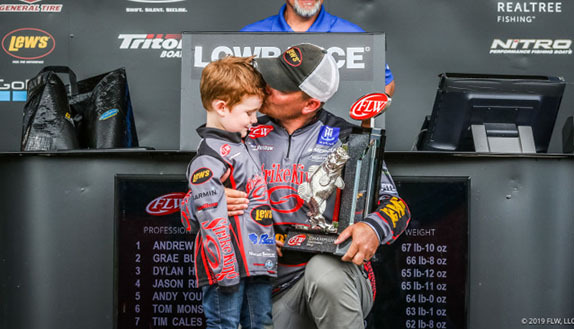 "We started putting the pattern together on Sunday (4 days prior to the start of the tournament), and halfway through that day we figured out the depths where the better fish were hanging out," he said. "Then Gary went out with Cody Meyer on Monday and I ran all kinds of new stuff. "Gary came back to fish with me on Tuesday and Wednesday and it was pretty humorous. I told him I wanted him to check something for me just to validate my thought process. I took him to an area and explained what I was doing, and right away he sets up on a 2 1/4-pound fish, and then I set up on another 2 1/4. "I asked, 'Do you think I'm right?' and he just got a big grin on his face," Gutierrez continued. "Then we just started running similar stuff and catching them here and there. I told him I hoped it didn't hurt his feelings if I felt like I needed to get off the water, because I was done." He ended up with a milk run of perhaps 10 different points, scattered all over the lake in the various river arms (Shasta is fed by the Sacramento, Pit and McCloud rivers and Squaw Creek serves as a fourth major tributary). He focused on transitions to gravel from red clay or chunk rock and used a Duo Realis Spinbait 90 as a search bait. When it got nudged, he'd slow down and work the area with finesse offerings. He caught many of his fish on a dart-head rig during practice, but would eventually switch to the Nail, as it proved more suited for maintaining bottom contact in deep water in the harsh winds that blew on the competition days. Gutierrez opted to start day 1 on a rock pile near a bridge piling at the magical 30-foot depth � a place where he'd gotten one good bite in practice. It produced a 3-pounder, and he added a quartet of 2s from various locales to round out a decent opening-day stringer. Day 2 featured even stronger winds than the previous day, and he again started on the rock pile. One of his first throws with the dart-head resulted in a 5-pounder, and he stuck a 4 soon thereafter. He switched to the Nail a bit later and stuck a big one that made a 20-yard run and cut off his braided line on a corner of the piling. He tried the dart-head again and hooked up with another pig that made a 50-yard run and was laying on its side next to his boat at one point, but managed one more run and pulled off. "I was just devastated," he said. "I probably sat there for about a half-hour, then I decided I was going to leave those fish alone � I'd come back and wreck them the next day. I knew I could make the cut with (three 2-pounders), and I went and got those real quick." That haul not only got him to the final day, but put him in the lead. And when day 3 dawned cloudier and with more of a breeze than the forecast had predicted, he knew he had a good opportunity to close out the victory. He garnered a limit from the rock pile, but it consisted of a 3-pounder and four fish that barely met the minimum-length requirement. Assuming he'd fished that place out, he started bouncing around and throwing a finesse jig. That bait enticed some bites, but the fish weren't inhaling it. He reverted back to the Nail and made three culls with 1 1/2-pounders. He had one more big-fish point left to hit, but it produced only a couple of similar-sized fish. "That's when I realized that, with the water coming up so much, I wasn't on the right seam. I repositioned the boat and made another cast, and I told my co-angler that it was going to be the last one if I didn't get bit." He let the nail bounce down off the rock and at one juncture it took too long to settle, so he began to reel furiously. When he caught up with the fish, he knew it was big, but it was rolling in the manner of a large catfish or brown trout, both of which are common in that vicinity. He pumped the fish to the surface and was pleasantly surprised to discover that it had neither whiskers nor colorful dots splattered across its sides. It was another 5-pound spotted bass. "I knew that would do it," he said. "Lights out." Gutierrez focused on the leeward side of the points. "I think that nice weather we'd been having put them into the pre-spawn mode, so I started running areas where they should be staging to come up," he said. "Once the wind started blowing, it positioned them hard on those transition areas. They could just sit there on the lee side and eat the shad that were stacked up. "(The structure) had to have wind coming across it � there had to be current. Those places were easy to recognize by all the debris and the mud lines." > Shaky-head gear: 7'1" medium-action iRod Genesis II rod, various spinning reels (Abu Garcias and Pfluegers left over from his Elite Series stint), 15-pound Spiderwire Stealth Blue Camo braid (main line), 6-pound Gamma Edge or 7-pound Gamma Touch fluorocarbon (20-foot leader), 1/4-ounce Frenzy Nail jighead, Reaction Innovations Flirt 4.95 (green-pumpkin or watermelon/green-pumpkin). > He began the event with green Gamma braid, but switched to the Spiderwire Blue Camo for better visibility in the dark, windy conditions. > He said the Frenzy, which features a recessed head around the line-tie, was designed to move easily through wood, grass or rock and can accommodate just about any size or shape of plastic trailer. "If it does hang in the rock, you can shake it a little bit and it comes right out." > Main factor in his success � "A lot of experience on that water over the years, and plus I'm making moves quickly and starting to believe in everything I do. As soon as I start getting the 'happy feet,' I make a move." > Performance edge � "Having that Frenzy Nail. I knew I could catch 10 pounds anywhere with that bait � the fish have been eating it so well and I have so much confidence in it. Knowing that allowed me to try some other things."